A few weeks ago, Nathan & I were driving through Maine looking for a store called the Kittery Trading Post, which I promise to cover in another post. Along the way, I complained that I had to use the facilities (I have a bladder the size of a small child's on a road trip). As we wandered through podunk Kittery, I shouted for Nathan to stop the car. For this. In case you're not inclined to watch this very short video of me panning through someone's snowy yard, I took a still photo for you. Someone has pointed out to me that in the summer, these lawn ornaments might serve as planters. But that doesn't change the fact that they are toilets. This gives a whole new meaning to the word "flowerpots." Get it? Pots? Oh, crap, I'm funny. hahaha, this is bizarre, but really great. People are so weirdddddd! Lol. Oh wow. I have no words for that. 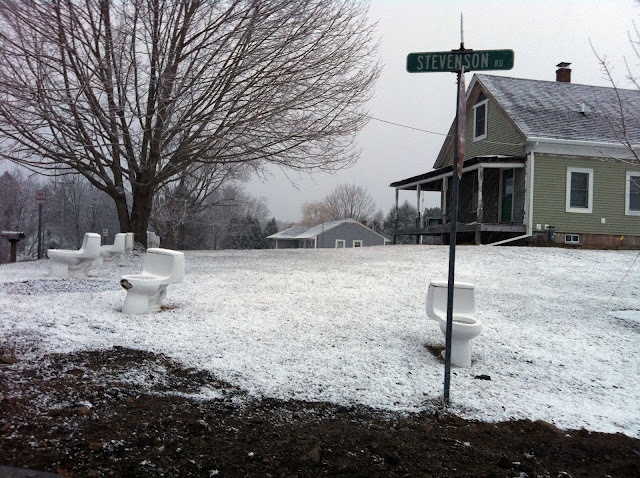 I mean, I guess they could be planters, but yes, they are toilets. This rivals odd things I usually see in my podunk area. I agree - you're still growing things in TOILETS! I actually kind of want to do this now. Maybe. And think of how easy it is for the kids who live there to tell their friends where to come hang out! "Yeah, I live in the toilet-yard house." Not all that uncommon in Maine. AHAHAHA I've got friends in LA who have those but they're in the baaaaaackyard at least.